Dirt that collects on the surface of your ceramic tiles can lead to scratches and etches that could take away its shine and give it a dull and dirty look. However, by mopping it each week, the floors can be kept looking clean, and dust- and damage-free. Use a broom to sweep the floor well. Alternatively, use a vacuum cleaner. Remove all dust and dirt, especially in forgotten corners and far edges of your room. Look closely at the floor for any signs of dust left behind as this will cause streaks on the floor while mopping it. Choose the cleaning solution that best suits your ceramic tile flooring. It’s best to go with a mild cleaning detergent. Put a few drops of this in some hot water and ½ cup vinegar. Or, you may choose to go with a commercial cleaner that’s meant specifically for ceramic tiled floors. Dip the mop into the prepared cleaning solution, wring out all excess water and mop the floor. In the middle of your mopping exercise, wring out the mop as often as you can or as and when you think the mop begins to look dirty. Throw out the cleaning solution whenever you see its color has changed since this could increase its chances of streaking. 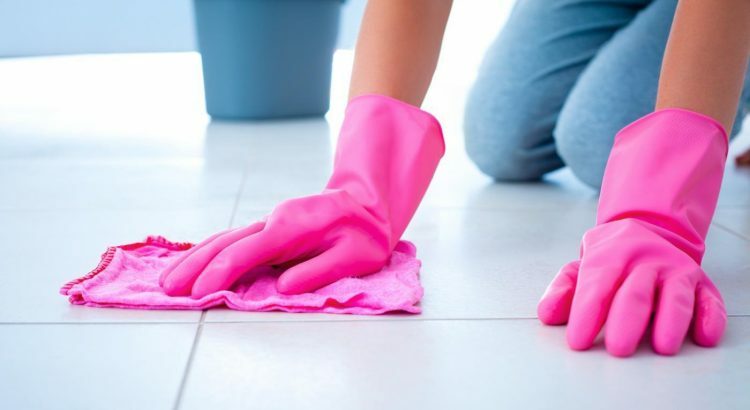 Now, mop the floor using clear water to get rid of all the residue of the cleaner. Use a clean towel to dry the floors soon after you mop them. Wipe it so that you negate the possibility of streaks forming when the air dries. If you have a large area to mop, break it up into small sections and dry each one before you begin work on the next. You can prevent dirt from building up by mopping the floor every day. Streaks will not develop and you will have a squeaky clean ceramic tile flooring. If you let the cleaning solution dry on the porcelain tiles, it will lead to streaking and staining. Wipe up spills immediately or you will stain the floor. Before using any cleaning solution on your ceramic tiling, do a test on a small part of it. You will know from this how safe it is to use. Before you start out to clean your ceramic flooring, add a little vinegar to your mop water or cleaning solution. Not only will it dry your flooring faster but it will also sparkle a lot more than with soap and water. Manisha Kr is a blogger who loves to advise on vacuum for tile floors and woodworking. When she is not writing, she is either playing golf or trying to craft something out of the planks in her garage or simply cooking her favorite recipes.